The Globe is the first Canadian partner of The Trust Project, which launches Thursday. As part of a major redesign and re-engineering of the newsroom to an audience-first strategy, The Globe and Mail is strengthening efforts toward bolder and stronger journalism in a world that is besieged with mixed signals of fake news, filter bubbles and content feeds controlled by algorithms. Along with other notable publishers around the world, The Globe has helped formulate the first system of industry standards for digital news publishing to fortify truth, transparency and trustworthiness. The Globe is the first Canadian partner of The Trust Project, which launches Thursday. 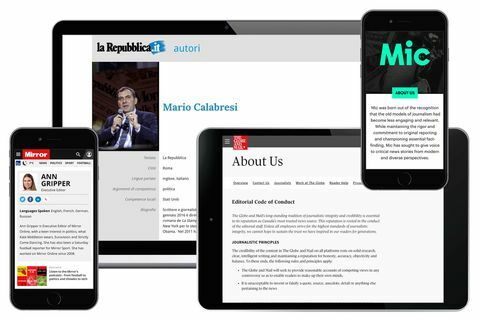 It's a consortium of major publishers and platforms in North America and Europe that is implementing a defined set of protocols for digital content to help readers easily identify quality and credible journalism they can rely on. How, in the case of investigative news, the stories were crafted. Journalism is founded in best practices and the principles of truth, trust and transparency. The Trust Indicators content requirements have been part of journalism practice for many years, often found in story descriptions, author information, biographies and formal policies outlined in editorial codes of conduct. "Trust is vital in news media and it is the foundation on which we build our business," said David Walmsley, editor-in-chief and a Trust Project co-founder. "We understand that Canadians continue to rank The Globe and Mail highly as a trusted source. However, any erosion of trust is something that affects all journalists, and more importantly, democracy. We stand alongside all journalists and readers who deeply value journalism." "The Trust Project isn't just about markup on the page or buried codes of conduct on websites. It is about looking through the eyes of our audience and helping them truly understand journalism standards and trade expertise without having to work hard to find or even understand them," said head of audience Cynthia Young. Led by journalist Sally Lehrman at Santa Clara University's Markkula Center for Applied Ethics, The Trust Project is essential at a time when only one-third of Americans polled by Gallup say they have a great deal or fair amount of trust in media. In Canada, the 2017 Edelman Trust Barometer found consistent changes in the public's trust in traditional media in the past five years. While some outlets already disclose information included in the Trust Indicators, the new system establishes standardizing this information across the industry, enabling better integrations with platforms distributing content and consistently clear labelling for readers. Most of the indicators that readers will see have two parts: a reader-facing signal (such as a highlighted "opinion" label) and a machine-readable signal (a related tag in code markup). The machine-readable signals are a common tag used by multiple news organizations, thus creating an industry standard and improving the quality of journalism. News organizations are not the only participants in this effort. Digital platforms such as Google, Facebook, Twitter and Bing will use these indicators on their platforms as well, helping readers to discern which news stories in their search results or feeds are trustworthy. The first phase of the Trust Indicators are integrated into Schema.org Version 3.3, including common tags such as "News Media Organization" and "Publishing Principles." Schema is a shared markup vocabulary used by several digital platforms and websites. In later phases, additional tags and features will be added to strengthen industry standards even further. The Trust Project will continue to collaborate and grow, with more news organizations joining and implementing these indicators on their websites. The project is funded by the Craig Newmark Philanthropic Fund, Google, the John S. and James L. Knight Foundation, the Democracy Fund and the Markkula Foundation. On Friday, there will be a free panel discussion at the Newseum Institute in Washington and further detail about the project's efforts to rebuild the public's trust in journalism. For more information, visit thetrustproject.org. Devin Slater is head of editorial design for The Globe and Mail. Angela Barber is a senior member of The Globe's user-experience team. They are both contributing members of The Trust Project's UX and Development working groups.